Have you ever gone to a 4th of July party or BBQ? Have you ever been to a 4th of July party when you’re trying to get healthy or lose weight? It can be difficult to stay on track with foods like that. Luckily, I have lots of tips and healthy recipes you can use. They’re quick, easy, and work. The best part? You’ll be able to celebrate guilt-free and avoid unnecessary toxins, bloating, fatigue, and weight gain. It’s good to have breakfast with lean proteins and veggies. The protein and fiber will help keep you full and regulate blood sugar so you’ll avoid cravings. I recommend using organic eggs to make omelets, scrambled eggs, or egg muffins with spinach, onion, mushrooms, broccoli, asparagus, and/or tomatoes. As summer heat increases, your daily water intake requirements do, too. And no, the water in your Iced coffee doesn’t count. Ideally, you’ll want to have at least one 8oz. glass of filtered water an hour. Water will keep you hydrated, boosts energy, is calorie-free, helps regulate hunger, and prevents overeating. Bonus points if you add fresh lemon juice, or muddle other fruits in your water. The fruit adds natural flavor and nutrients that absorb into your cells which helps you feel more energized and hydrated. I always recommend avoiding bread/buns, cheese, dips, and chips, pretzels, etc… These processed foods are high in carbs and sodium, which make you retain water. They also tend to be higher in toxic, inflammatory ingredients and GMO grains. Hello bloating and water retention! As you retain water, you’ll be retaining those toxins longer, too. They’ll leave you with too-full which isn’t a cute feeling… especially if you’re in a bathing suit or shorts/tank. It’s best to skip these foods. 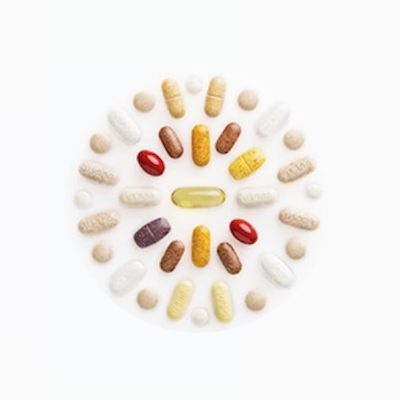 Processed Starchy/Sugary Carbs + Fat = The worst nutrient combination for health and fitness. Instead, pair veggies with lean proteins and healthy fats together. The fat, protein, and fiber will help keep you full and energized – without a carb crash. The fat also helps your body absorb nutrients better. Clean, lean proteins, combined with veggies are filling but light and will help you feel satisfied and energized instead of blah and bloated with a bulging belly. Fresh fruit is a great option if you want something sweet, too. 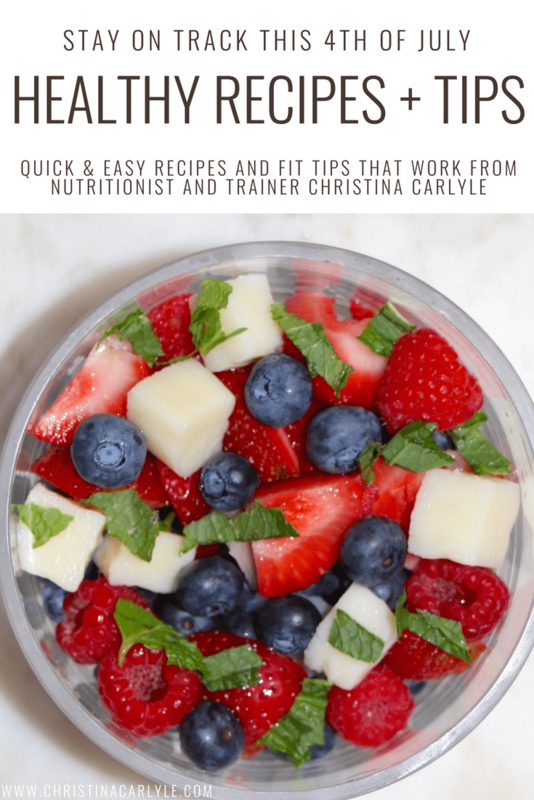 The best way to stay on track is to bring your own healthy recipes to your get-together. That way everyone will have healthier options available to enjoy. 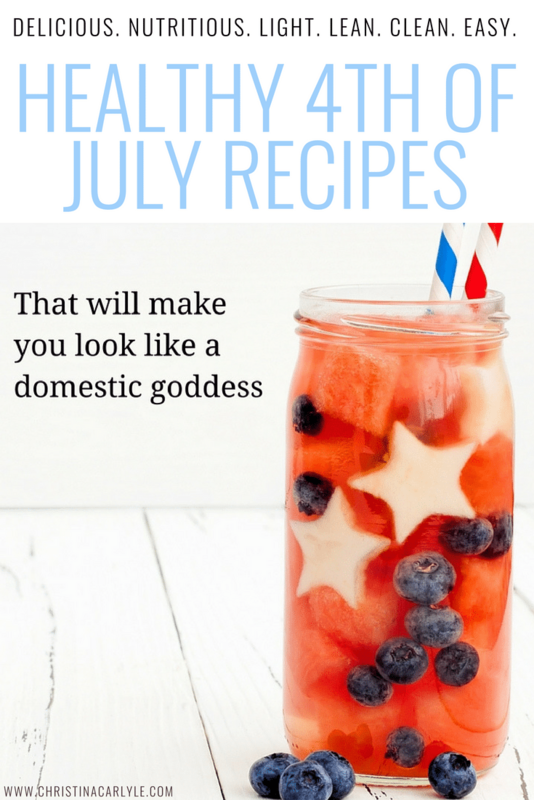 The following recipes are healthy perfect for your next patriotic party. They are delicious, nutritious, and made from real food. They also have red, white, and/or blue colors. These healthy recipes will set your 4th of July party apart. Organic ingredients are recommended. 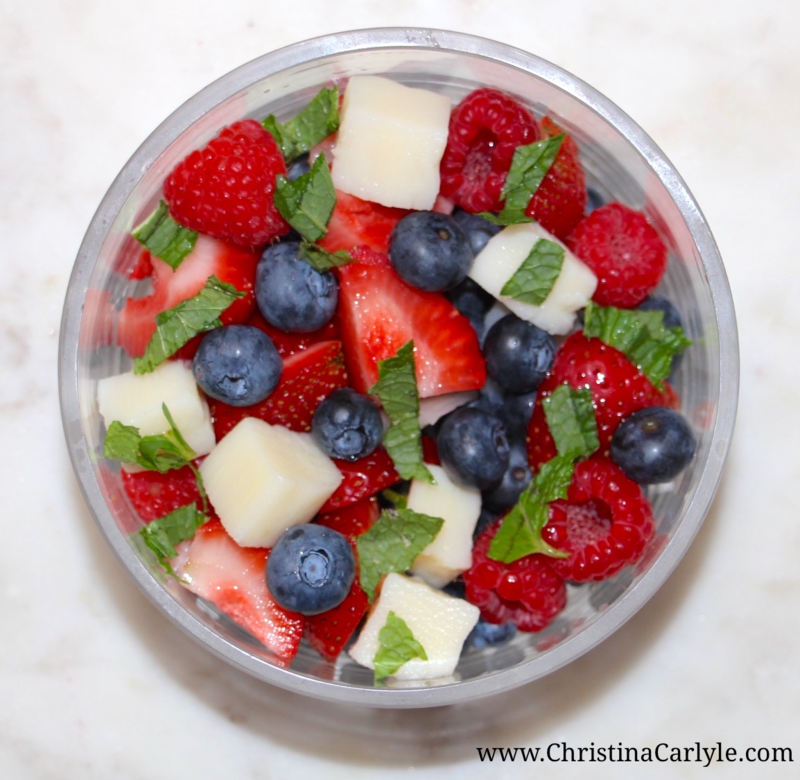 This 4th of July fruit salad is GORGEOUS and refreshing on a hot summer day! It’s full of nutrients, fiber, light, and low in calories. It’s easy to make, too. Wash, dry, and combine fresh raspberries, strawberries, blueberries, and chopped hearts of palm. Top with lime juice and honey to taste. Then garnish with some freshly chopped mint. 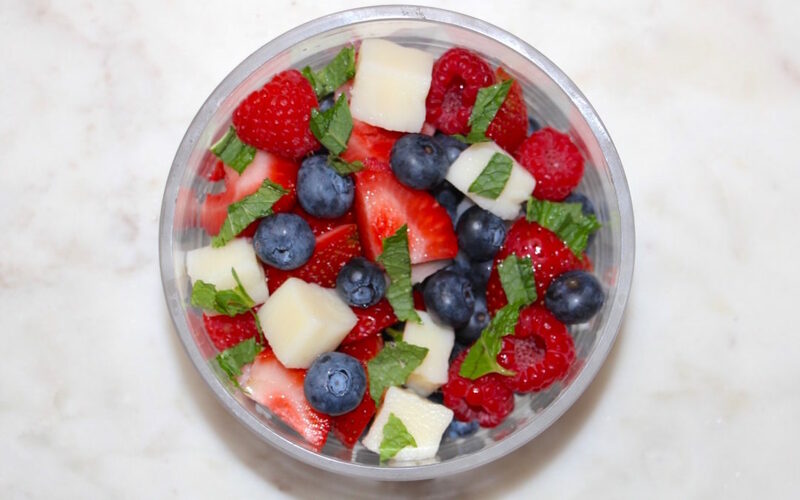 The hearts of palm add more fiber and a pop of tartness that pairs perfectly with the berries. No hearts of palm? No problem! Swap in chopped red delicious apples instead. Bruschetta is light and low in calories but so full of fresh flavor and vitamins. I know I mentioned before that you should skip bread… and I meant it. But, bruschetta isn’t just for bread. Preparation: Combine all the ingredients except lemon, lime, and salt in a mixing bowl. Once combined, squeeze lemon and lime juice over the mix and add the salt and pepper to taste. Mix well and chill before serving. Other healthy plant-based dips and toppers include: Salsa, pico di gallo, hummus, and guacamole. They have fiber, nutrients, and are a lot healthier for you than dairy-based dressings and dips. I love these because they combine lean protein, healthy fats, and fiber in one quick recipe. They’re easy to make, light, but filling and taste great. Prepare the tomato cups and chill in the refrigerator. Combine the other ingredients in a small bowl and mix well. 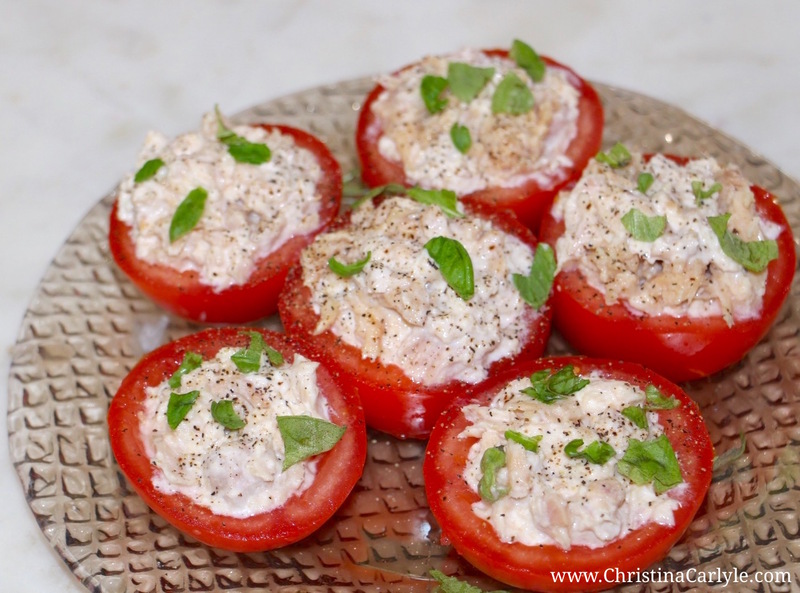 Spoon the tuna salad evenly into the tomato shells. Season with salt and pepper to taste. Chill before serving. They are great over a bed of lettuce or as an appetizer. This crunchy chicken salad is so delicious and easy to make. I like serving it in crunchy romaine leaf boats and eat-em-like-tacos. They’re savory and sweet, creamy and crunchy. Combine all ingredients except lettuce in a bowl and mix well. Chill before serving. Serve on a bed of lettuce or enjoy it alone. I also like to suggest, Healthy Kabobs made with lean proteins and veggies on the grill, too. Kabobs are healthier and leaner than traditional hamburgers and hotdogs – and you don’t need a bun! Check out my Healthy Kabob Recipe here. 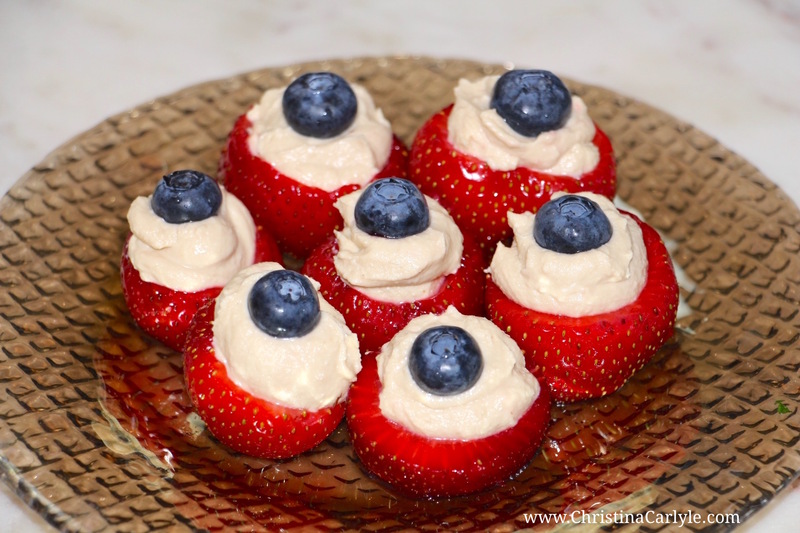 How amazing do these hummus stuffed strawberries look? They’re so pretty and take minutes to make. Simply, core a strawberry and fill it with a teaspoon of hummus. Top off your caps with a single blueberry and you’re done. 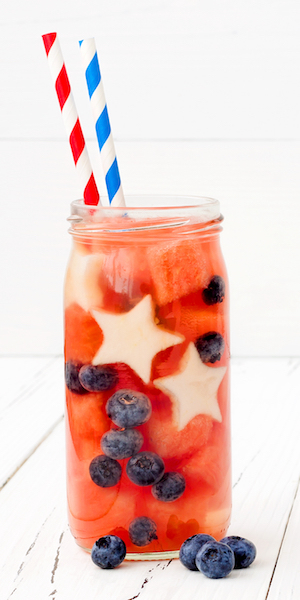 This patriotic drink recipe is easy and fun. Use a star-shaped cookie cutter and press into fresh apple, pear or watermelon slices to make little stars. Fill a glass with water and ice, then add your stars, blueberries and watermelon cubes to water for a refreshing, delicious drink. Which tip or recipe was your favorite? Let me know in the comments. P.S. Check out this post with tips that will show you how to avoid gaining weight during the holidays. If you struggle with emotional or social anxiety eating at parties, it will help you! I agree with you, it is very difficult and tempting to eat a lot during parties. I will surely try these recipes of yours. Thanks a lot. Thanks for your advise its very helpful. Hi! I’ll add salad recipes to my editorial calendar. Make sure you sign up for my VIP only newsletter and you’ll get them emailed to you when I post them.